Mark Lowey graduated from California Polytechnic State University, San Luis Obispo, in 1977 with a Bachelor of Science degree in Construction Engineering. 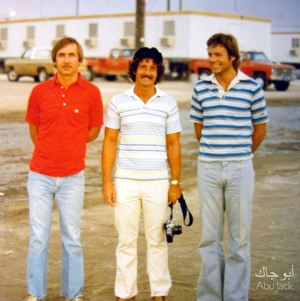 In 1978 he began working for Santa Fe International of Orange, California and was sent to Saudi Arabia to work on Aramco construction sites as a Site Project Controls Engineer. 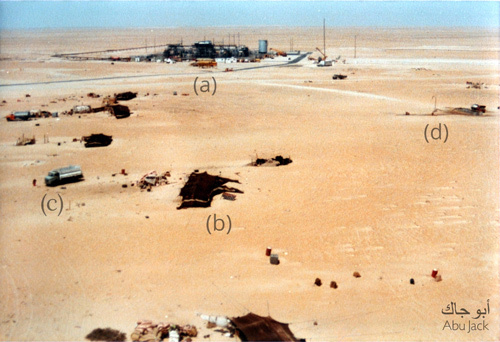 Shortly after my arrival in Saudi Arabia in 1978, I was assigned to a Gas Oil Separation Plant (GOSP) construction site, Ain Dar GOSP-4, which was a one-hour drive from my new home in Abqaiq. Santa Fe was a subcontractor to the main contractor, Fluor International, also of the USA. Fluor oversaw the construction of six new Aramco GOSPs in Shedgum, Ain Dar and Fazran. 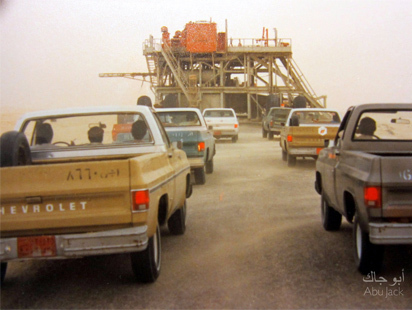 Flat, vast and void of landscaping, the Abqaiq Contractors Camp across the road from the Aramco community camp lived up to its nickname, “Moonbase.” The camp housed 10,000 men of different nationalities working for contracting companies that supported Aramco. Before arriving, I had been told it was a “bachelor” camp, meaning all-male, but it was still odd to live in an environment with no women. Nevertheless, free meals, laundry service, and room cleaning weren't such a bad deal. Our living quarters were modular, portable trailers set on small concrete foundations arranged in neat rows. The one-man, side-by-side bedrooms had a single bed, freestanding closet, two-drawer bedside table, dresser, small desk and one window-mounted air conditioning unit that provided soothing “white noise” to sleep by. Down a long interior hallway, we shared communal showers and toilets. The linoleum floor gave a little with each footstep, and the lack of sound insulation in the walls between rooms was revealed when your next-door neighbor had visitors or played music. There wasn’t much space for decorating in my small room, but I tried to make it a bit more comfortable. A large world map went up on the wall for reference, as I was interested in the Middle East’s geography and looked forward to my first visits to Asia and the Far East. I placed a small plastic box of red push pins nearby to mark the places I would travel to. A large Sanyo “boom box,” a combination radio/cassette player, from the Abqaiq souq found a home on the bed table right next to the thoughtful gift from my grandfather: a cutting edge, super-slim digital alarm clock. The final touch was a ghutra, the traditional red-checkered Arab head dress, that I thumbtacked to the ceiling to cover and soften the harsh light of the fluorescent fixture. This was a technique I learned in university dorm rooms in the early 70’s. And so, I settled into my home away from home. Each group of like nationalities had their respective dining halls and recreational facilities. The free meals were good, all-you-can-eat and familiar with weekly steak nights, apple pie and pancakes at breakfast. Our part of the camp had a swimming pool, outdoor basketball court, weight room, dirt soccer field and recreation room with a ping pong table and television. One afternoon before dinner, I walked into the normally deserted TV room only to find it smoke-filled and packed with British, Scottish and European colleagues cheering a videotaped recording of a World Cup football (soccer) match between Netherlands and Scotland. I’m not sure if the video’s format was Betamax or VHS, but early versions of both were available that year, and we were fortunate to have access to this new technology. Being American, I’d never seen soccer on television and failed to grasp the significance of the match, so I didn’t stay long, preferring to play ping pong, instead. The camp management organized a softball league, and I joined the Santa Fe team. We were provided with all the equipment, including bats, gloves and balls – I had not brought mine with me. We were Americans and Canadians plus one colleague from Rhodesia who joined the team after a brief review of the rules. A cricket player, he preferred to field without a glove, and we laughed at his awkward, yet effective, cricket-style batter’s stance and swing. He could catch, throw and hit, but some of the finer nuances of base running took him longer to master. Other companies fielded teams, including a strong squad of Filipinos. The camp had a dirt ballfield, but sometimes games would take place at the Aramco camp on a beautiful, well-manicured grass baseball diamond. It was a treat to play on the Aramco field, but it made me a little homesick, as well, especially because American families lived there with women and children, which was a novel contrast to my situation. Our living quarters had no telephones, and the phones in the Santa Fe office, just outside the camp, were restricted to local calls only. Calling long distance to friends and family back home was an expensive and time-consuming endeavor. I had to drive to the Saudi government exchange in Abqaiq town and fill out a form to book the call. Normally, it was late in the evening to allow for the time difference in the U.S. After waiting for up to two hours for the operator to make a successful connection, you were invited to enter a small, private booth to speak on a phone to loved ones for around $3 per minute. The voice delay, back and forth, could be frustrating and result in awkward and confusing conversations with one party talking over the other. Sometimes, inexplicably, no connection could be made and you had to return to camp, disappointed, in the wee hours of the morning. I preferred to correspond with newsy, handwritten letters, especially to my parents. Back then, the Saudi postal service could be slow and unreliable, so I would seek out friends and colleagues, who were traveling to the USA or Europe, and ask them to carry and post my letters when they arrived at their destination. I gave them money for postage. Each of us took turns doing this – a day or two before your own vacation you could expect a pile of letters to carry home. Mail in the other direction could be sent to the company’s California address, and a mail pouch would be sent to Saudi once a week. It was always a happy occasion when letters addressed to me would eventually find their way to the job site, delivered by company drivers. We worked “six tens” – six days per week, Saturdays through Thursdays, ten hours per day. Each day at 4:30 a.m., I would grab a quick breakfast at the dining hall and jump into a van or shared pick-up truck for the 60- to 90-minute drive on the Ain Dar road. I preferred the van so that I could sleep in the back seat where a hunk of foam served as my pillow. Summer temperatures in the oil fields regularly reached 115 and 120 degrees Fahrenheit. The pickup trucks we shared for commuting to the job sites had no air conditioning. Instead, back then, trucks had small, triangular-shaped front wing windows, which we would swing open to provide much-needed ventilation. However, this practice was less than ideal during a sand storm. On such days, I was envious of more senior-level colleagues who drove air-conditioned trucks and sedans. Commuting between Abqaiq and the remote GOSPs was a daily adventure. The two-lane roads were busy with cars and big trucks. Accidents occurred with unsettling regularity and, usually, the wreckage was pushed to the side of the road and left there for all to see. Perhaps it was to remind drivers to slow down, and because much of the roadside properties remain undeveloped throughout many parts of the Middle East, this practice continues today. The paved roads appeared deceptively flat but actually weren’t. Truck drivers would sometimes pass on blind hills and curves. It was frightening to witness. When they passed, you quickly pulled onto the unpaved shoulder to get out of the way. 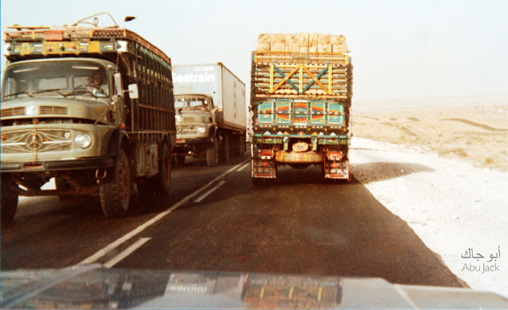 The general belief was that the truck drivers, typically Pakistanis or Lebanese who embraced the concept of fate (kismet), felt that if your time had come, then there was nothing to be done to prevent it. So, why not go ahead and pass? Given that philosophy of the road, we learned to drive very defensively. 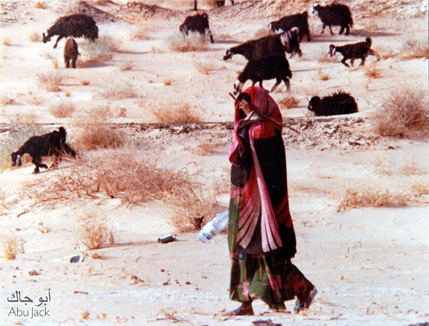 Herds of camels and goats randomly crossing the desert created additional hazards. Besides the obvious personal risks, accidentally injuring or killing camels or goats could result in a hefty cash payout to the owner of the herd. We always stopped or slowed to a crawl when animals were on or near the road. Traffic on Ain Dar Road. Trying to get home after work on Fazran Road, during a sandstorm, behind a slow-moving drill rig that took up the entire width of the road. A shepherdess and her goats beside Ain Dar Road. Today, Fazran Road looks the same today as it did in 1978. After a few months at various Ain Dar sites, I was assigned to a GOSP construction site in Fazran at the northern edge of the Saudi kingdom’s Ghawar (oil fields) along the path of the traditional north-south Bedouin migration route. The work day began at 6 a.m. and ended at 4:30 p.m. with a 30-minute break for lunch. Brown-black striped tents of Bedouin encampments. 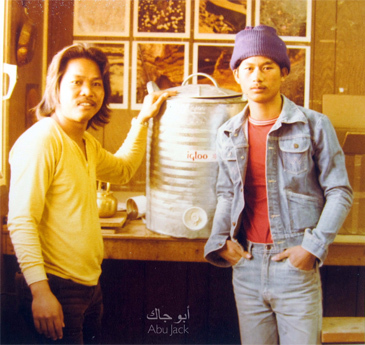 Aramco-provided permanent water supply; an upright pipe with a curved top used to fill the tanker trucks that delivered water to desert dwellers who kept large, metal cisterns near their tents. I worked in a typical small white trailer adjacent to the site. 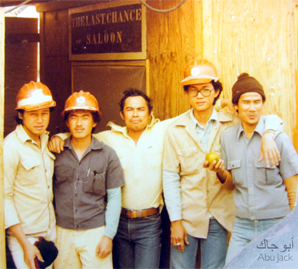 The construction staff primarily comprised Canadians, English, Americans, Filipinos, and Thais. Men only, of course, much like Saudi construction sites today. Not much has changed in today’s construction site offices, except for the addition of computers, laptops and cell phones. The closest telephone was in the Project Manager’s office about 50 yards away. I could make outgoing calls to other job sites and to our Abqaiq office. On the rare occasion that I received a call, the PM would send a runner to my office to fetch me as the caller waited, patiently. My office was often used for spontaneous meetings and negotiations with participants of many nationalities – sometimes just to escape from the heat and take a break. I tried to accommodate all visitors as I began to learn the desert code of generosity and hospitality. I kept snacks and tea and coffee on-hand, and the aluminum Igloo cooler on the table in the corner was kept full of fresh ice and drinking water. Mark’s site office at Fazran. Site workers replenish the drinking water Igloos. My daily duties were similar to those back at the home office in Orange, California, but here I was on a real construction project. In the days before desktop computers and printers, we used adding machines. Charts and graphs were hand-drawn in pencil or pen on ruled paper. I performed project controls tasks related to my site’s construction planning and progress, walking the site to monitor and record physical progress that I fed into a primitive automated accounting system to calculate the project’s overall percent complete. The goal, of course, was for the actual progress to keep pace with the planned progress and, thus, finish the project on time. Santa Fe’s supervisors and foremen were experts who were happy to explain to me what was going on and the problems they were encountering. It was especially exciting on the day of a major event, such as the erection of a pressure vessel or the installation of a large compressor or substation. The mobile crane would be mobilized and, if the weather was suitable and winds relatively calm, we would gather a safe distance away to witness and photograph the activity. My two routine office tasks involved preparing the two-week look-ahead schedule and marking up Isometric drawings (ISOs). Gas oil separation plants have miles of piping and hundreds of valves that connect the vessels, tanks, and equipment. ISOs are prepared as part of the plant’s engineering design and used for fabrication of “pipe spools” and, later, to keep track of the progress of fabrication, installation, and testing. With different colored highlighter pens, I would mark directly on the ISOs, accordingly, and update them daily. Watching the project move forward, little by little, is one of the satisfying aspects of construction project management. Since Fazran was a remote location, lunch was delivered daily to the job site. Westerners received a box lunch with a sandwich, a piece of fruit and a small can of juice. The Thai and Filipino site workers enjoyed a communal hot meal of rice and meat in an open-air mess hall irreverently named “The Last Chance Saloon” with a sign over the entrance. There were plenty of leftovers, so when the workers finished their lunch, a couple of Bedouin boys would collect the remaining food and quickly load it into the back of a small Toyota pickup truck that disappeared into the desert, most likely to be distributed between several families. Nothing was wasted. Workers break for lunch at The Last Chance Saloon. Bedouin boys collect extra food. 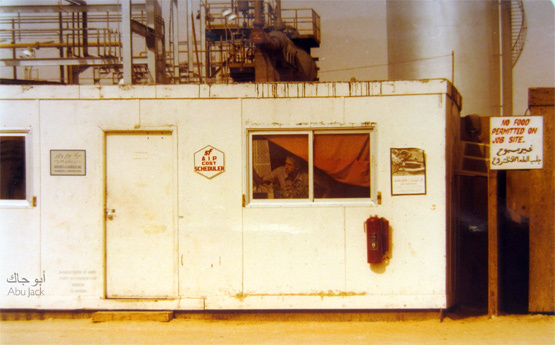 Apart from our offices and the construction site itself, there was a smoking shack for the site staff, a nurse’s room with a small cot and first aid supplies, storage containers for tools and construction materials and barrels of diesel fuel and gasoline. Several American-style school buses transported the site construction workers who were skilled craftsmen such as electricians and pipe fitters. Two white portable toilet booths were positioned a short distance from the site offices. Some of the workers weren’t accustomed to western-style toilet seats, so they would squat with their feet on the seat. Sometimes, I would find sandy shoe prints on the toilet seat. Talk about culture shock! They were probably just as confused as I was. One afternoon, my small office suddenly filled with around twenty men: Saudi government representatives, Bedouin tribesmen and my company’s government liaison staff. The previous day, several goats had accidentally been struck and killed by one of our bus drivers on the Fazran Road. An hour-long, animated negotiation in at least three languages proceeded with each party having a chance to state their case. In the middle of the discussion was a Somali laborer named Mohammad. An honest man, Mohammad had earned the trust of the Bedouins and the Fluor/Santa Fe folks, alike, and he was the go-to, unofficial Arabic-English translator on the job site. I sat at my desk, off to the side, observing this colorful scene. The outcome was the agreement of a fair and appropriate compensation to be paid to the owner of the goats – a total of 1,000 Saudi Riyals ($265). This amount represented approximately four to five times the Thai bus driver’s monthly salary. My recollection is that the company helped the driver pay this settlement. 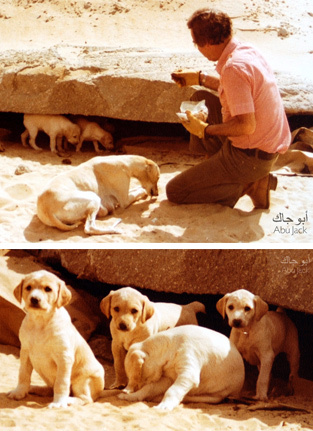 Not far from the construction site, a female Saluki desert dog gave birth to five puppies. To protect her litter, the mother had dug out a shallow den, a cool refuge from the relentless heat, below a smooth slab of concrete “over-pour” that had solidified after construction crews poured it onto the sand. 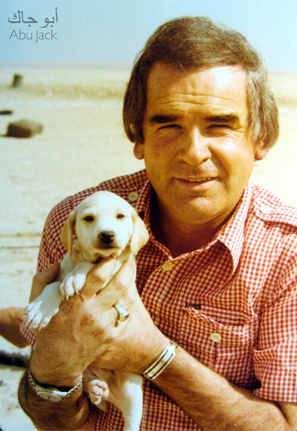 One of my colleagues, a tough, no-nonsense Scottish electrical foreman named Fred Cameron, would visit them regularly to feed them chunks of meat wearing leather gloves in case of a bite or scratch from these feral dogs. Salukis, also known as Persian greyhounds or gazelle hounds, were originally bred, centuries ago, in the Fertile Crescent – the region spanning from Egypt to Iran. Slim, sleek and swift, these dogs are well-suited for survival in the harsh desert environment. As noted by canine expert, Linda Case, Salukis are "sight" hounds—hunting by sight—and run their quarry down to kill or retrieve it. Historically, Salukis were used for hunting by nomadic tribes. Typical quarry included the gazelle, hare, fox, and jackal. 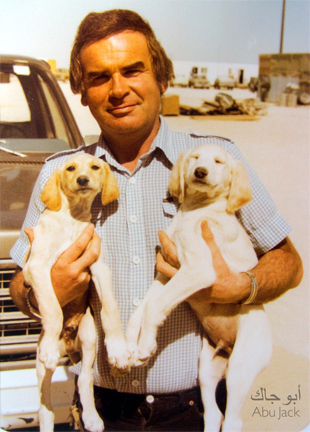 In his book, Natural Emirates, Peter Vine described unique hunting techniques using Salukis. While pursuing hares, Bedouin hunters would sometimes ride close to their quarry on a camel holding a Saluki, which would be thrown towards the prey, while at speed, to give the dog a running start. The Salukis I saw in the region were semi-domesticated and used as guard dogs. We enjoyed watching the puppies grow bigger every day. They reminded me of beautiful golden Labrador retrievers, stocky and plump, very unlike their lean, sinewy mother. Tragically, one morning we arrived at work to find the mother Saluki trapped beneath the slab of concrete that had served as the roof of their den. The unreinforced excess concrete had cracked and collapsed under its own weight into the excavated cavity below. She did not survive. We immediately adopted the puppies, and, because they were still quite young, we fed them and kept them in one of the site offices at night. Soon they were large and strong and were eventually claimed by the local Bedouins. 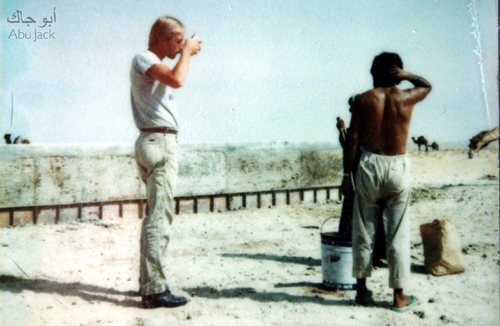 During my time at Fazran, I frequently met Bedouins, either passersby traveling on the migration route or families who encamped for extended periods near the site, attracted by the permanent Aramco-provided water supply. My brief, random encounters with these friendly people might include a simple wave hello, a smile and the traditional Arabic greeting, "As-Salamu Alaykum" (peace be upon you) followed by the response "Wa-Alaykum Salaam" (and upon you, peace). And, if I was lucky, an offer of fresh camel milk. Mark’s first taste of camel milk. Just milked and still warm, it was sweet and frothy. It wouldn’t be long before my minimal abilities in Arabic would be put to the test. I would soon embark on a lasting friendship with two Bedouin tribes – a friendship lost and rediscovered more than three decades later. Case, Linda P. (2005). The Dog: Its Behavior, Nutrition, and Health. Wiley-Blackwell. p. 26. ISBN 978-0-8138-1254-0. Vine, Peter (1997). 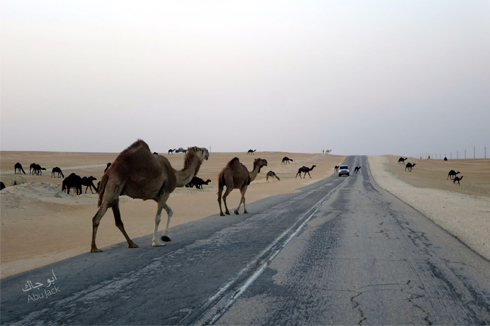 Natural Emirates: Wild Life and Environment of the United Arab Emirates. Trident Press. p. 233. ISBN 978-1-900724-02-9.